It's a deliberate extravaganza. Never have you felt "Jingle Bells" rumble in your chest so heavily or been mesmerized by "The Nutcracker Suite" so completely. 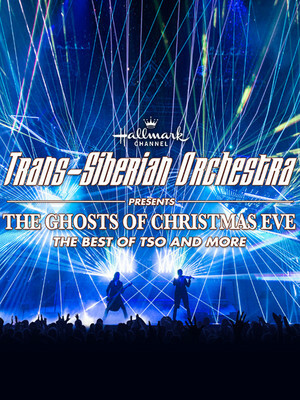 Why See Trans-Siberian Orchestra: The Ghosts Of Christmas Eve? The Tran-Siberian Orchestra hit the road with an exciting new production of their beloved classic, celebrating 20 years as top purveyors of Christmas spectacle! Including Ghosts of Christmas Eve alongside some of their all-time greatest hits - discover what keeps audiences coming back year after year! The rock band's concerts are arguably the most visually dazzling live event you're ever likely to see, featuring giant video screens, a pyrotechnics display that rivals many cities New Year's celebrations and more lasers than Star Wars. Composed of four original members, the group's touring lineup's ranks are swelled with entire string sections, dozens of extra musicians and choirs. As for the music, TSO take the likes of Pink Floyd and Yes as their inspiration, adding in elements of classical music, heavy metal and just about anything else which takes their fancy. You won't find many other bands switching from a lacerating guitar solo to the heavenly voices of a children's choir without a moment's notice. The Ghosts of Christmas Eve Tour is named after the band's 1999 holiday-themed\rock opera TV movie which they'll be playing live! Sound good to you? Share this page on social media and let your friends know about Trans-Siberian Orchestra: The Ghosts Of Christmas Eve at Huntington Center. Please note: The term Huntington Center and/or Trans-Siberian Orchestra: The Ghosts Of Christmas Eve as well as all associated graphics, logos, and/or other trademarks, tradenames or copyrights are the property of the Huntington Center and/or Trans-Siberian Orchestra: The Ghosts Of Christmas Eve and are used herein for factual descriptive purposes only. We are in no way associated with or authorized by the Huntington Center and/or Trans-Siberian Orchestra: The Ghosts Of Christmas Eve and neither that entity nor any of its affiliates have licensed or endorsed us to sell tickets, goods and or services in conjunction with their events.